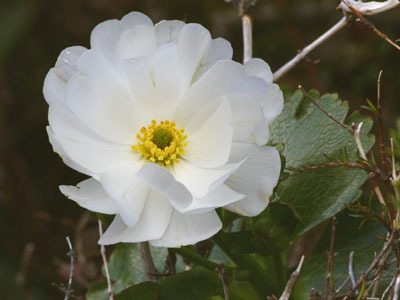 This magnificent plant is the biggest buttercup in the world, and one of the most magnificent, and like so many New Zealand flowers, is white. It is a big, robust plant, with thick leathery leaves up to 40cm across, and the flower can grow to a metre in height - the flower pictured below, growing through some thorny bushes, was nearly this size, and the flower 7 to 8cm across. 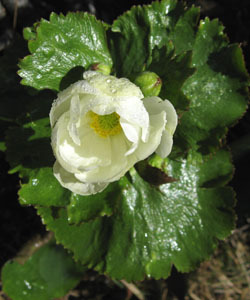 It grows in the wet mountain areas of South Island, at low alpine or subalpine level, and often along the side of streams, which is where we saw it first, just below the Hermitage Hotel. 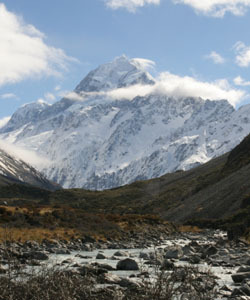 The New Zealand mountains have gravelly soils which drain quickly, while mists and regular rainfall across New Zealand's Main Divide keep moisture levels high. 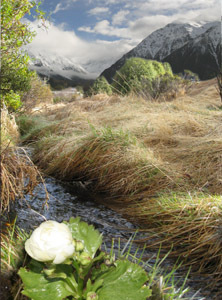 Thus the alpine flora demands the sharp drainage, sun and constant moisture of the high mountains. Ranunculus lyallii therefore has a reputation as difficult to grow, demanding cool conditions, constant moisture levels and sun. However if you can allow it to grow to its full height of a metre, and provide some spiny bushes in your alpine bed to support it, it will be really spectacular!